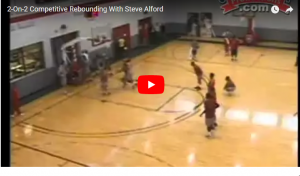 This video is a competitive 2 on 2 rebounding drill used by Steve Alford when he was Head Basketball Coach at New Mexico, prior to his taking the head coaching job at UCLA. This is a drill that he likes to use almost daily. Click the play arrow to see the video and make sure your sound is on as you watch. The video is a You Tube video. There are links to more basketball drills below this post.